I would like to sincerely thank you for taking time to read about us. We are an american privately-held, full-service real estate development, investment and management firm. We specialize in delivering luxury based investment opportunities in the central Florida Market, among other real estate investment alternatives. As of today, 1791 has traded more than USD 150 million dollars in condos, single families and commercial deals. We not only want you to deal with us once, we aim to be in your speed dial for life. If you would like to hear more about us please contact me directly or any of my colleagues. We look forward to having you over for a cup of coffee! 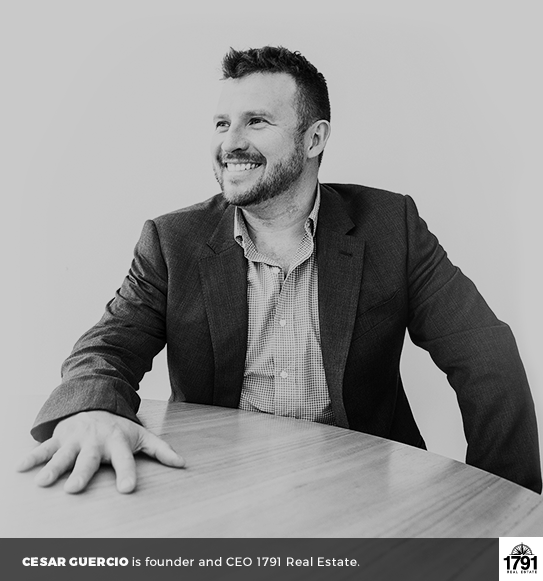 Cesar Güercio holds a Licentiate degree in Economics from UCA and a Post-Graduate Diploma in Entrepreneurship from ITBA. Before starting 1791, Cesar worked 15 years for key mayor players in Real Estate, Bank & Finance and Oil & Gas all over the world. He has co-author and publish papers on portfolio management and also delivered numerous Courses and Presentations on the subject. Cesar was born in the Patagonia Argentina and is very passionate about the outdoors and snowboarding.